CHICAGO -- An investigational agent for type 2 diabetes may also work as add-on therapy in type 1 disease, researchers reported here. Quick bit on Cgm accuracy. Join me (and a bunch of other people far more interesting than me) for a special session at the upcoming Children with Diabetes’ Friends for Life conference in Orlando on social media and diabetes support. 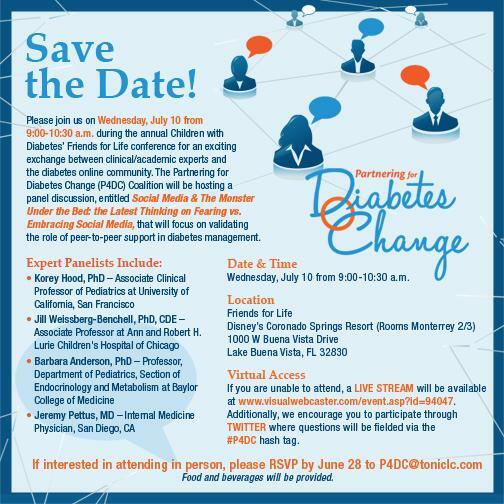 If you are planning to attend FFL this year, I'd love for you to join us for an exchange between clinical/academic experts and the diabetes online community. If you can't make it to FFL you can join a streaming of the event. DOC members (including your truly) will talk with a panel of clinical/academic experts assembled to specifically to discuss the value of peer-to-peer support and the online community. Participating live or online can help demonstrate the value we in the DOC place on peer to peer social media. If you plan to attend in person, please RSVP by June 28 to P4DC@toniclc.com. (I hope it fills up fast, maybe and early RSVP is better than later.) If you want to join the live stream please fill out this registration. We’ll also field questions on Twitter via the #P4DC hash tag on the day of the session. Partnering for Diabetes Change (P4DC) is a coalition of people living with diabetes and industry representatives aimed at addressing unmet needs in diabetes through community and collaboration. I am honored volunteer my time to help organize P4DC efforts, including this event. I am thrilled that the people at Johnson and Johnson support the community and make things like this possible. P4DC seeks to validate the role of peer support in diabetes management, address the stigma of type diabetes, and ultimately support underserved communities. You can be a part of the P4DC effort by participating in this live event, and by offering questions either in person or via Twitter. It is P4DC’s hope that through this session, they will be able to make a first step in showcasing the value of the DOC and the importance of social media engagement for patients. In PA? Call your Senator in Harrisburg. We need to get legislation out of the education committee and passed to Kids with Diabetes Safe at School. I sent this email to my senator's staff, Eric Pauly. They vote June 19 9:00am. Kids should be safe at school. Even kids with diabetes. I support safe at school. I have two kids with type 1 diabetes. I intimately know this issue. As a parent of children with type 1 diabetes, I want to thank the senator for his support of safe at school legislation in previous sessions. I hear rumors of a flip flop to the nurses union position. I hope not. I hope he will continue to support safe at school and vote for 871. It is a bill that allows local school officials and parents to cooperate to provide safe school environments for children with diabetes. I know there are many issues in the Commonwealth. I appreciate that your office has show nuanced appreciation for this approach to facilitating parents and schools to work together to keep children safe, in class without a de facto mandate from the capital to micromanage and inflatelocal school board budgets. I appreciate that he has shown leadership on this issue as a sponsor in the past. It is time to get this bill passed. Senator Greenleaf's continued support is an important step in the process. Diabetes requires ongoing vigilance. Diabetes management does not wait for legislative sessions. Unfortunately not all school budgets can expand to provide full time nursing. Local officials and parents should have the flexibility to agree to train a responsible adult to provide the needed diabetes support to help kids stay safe in schools. Safe includes medically safe. Most of the daily tasks for children with diabetes care now are provided or supervised by parents and other adults who have be trained by diabetes educators. This standard of care can work in schools where there is not full time nursing coverage. SB 871 anticipates that and is supported by the Pennsylvania Medical Society, demonstrating the processes this bill proposes are medically sound. There are best practices recommended for diabetes and schools created by the leading health and education professionals. They are in a document called Helping the Student with Diabetes Succeed: A Guide for School Personnel. It was written by the NDEP, a partnership of the National Institutes of Health, the Centers for Disease Control and Prevention, and more than 200 public and private organizations including school administrators, physicians and nurses. Not exactly bums. 871 makes the best practices of helping students possible in PA. They are not now. The bill is exactly the kind of considered approach needed to support kids with diabetes in schools. Thank you for your efforts to keep children safe in school. To help kids succeed in safe schools, I support PA 871. The nurses union is opposed, if the Senator vote with them I expect him to fund the increase in budgets across the state their position will require with the tax revenue non of us want increased. I love to see people set up. The DOC is disproportionally type 1. So is our family. Two T1D teens, one more or less T2D dad (me). I say more or less because the more I do what I need to do, exercise, eat right, etc the less type 2 I am. I know I need help staying motivated, peers to help me make changes habits. 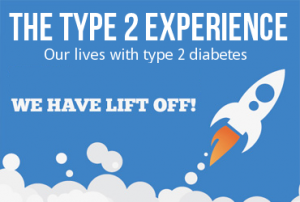 Enter The Type 2 Experience (TT2E) First the name brings to mind the Jimi Hendrix experience. That is a great thing. I currently am blasting Hendrix on iTunes. Hendrix is one of the coolest. Infusing T2D social media with more cool is a brilliant thing. These are some of the T2D rock stars. They can help shift the perception of our condition. In the introduction of the site they say of T2Ds, "We need to have a stronger presence in the Diabetes Online Community." Yay! T2D is more a function of genes than what most comedians would have us believe. Type 2 misconceptions, like others, is an easy target. While TT2E may not change the jokes on late night TV they can be place we can share with T2D friends and they can fine support and understanding. mySugr is available for US users from the Apple App Store. I have not yet had a chance to give it a good hard look but feel free to do you own looking at http://mysugr.com/companion/. "The National Institutes of Health is looking for volunteers to take part in a study to compare the long-term benefits and risks of four widely used diabetes drugs in combination with metformin, the most common first-line medication for treating type 2 diabetes. 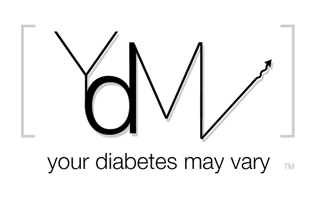 Beginning recruitment in June, the project is called the Glycemia Reduction Approaches in Diabetes: A Comparative Effectiveness (GRADE) Study." I am not making this up. In her May 13, 2013 article in the New Republic Judith Shulevitz writes extensively about isolation including how it can affect people at biological levels. Data... Indicate(s) that individuals with adequate social relationships have a 50% greater likelihood of survival compared to those with poor or insufficient social relationships. The magnitude of this effect is comparable with quitting smoking and it exceeds many well-known risk factors for mortality (e.g., obesity, physical inactivity). People living with diabetes know that it can set them apart, make them feel alone. The social stigmas associated with it, that it diabetes the fault of those who have it, doesn’t help. In Twenty-First Century Behavioral Medicine: A Context for Empowering Clinicians and Patients With Diabetes, David Marrero, writes that, "Diabetes is a challenging condition, both to live with and to treat.” He outlines roles for both family and wider communities in supporting self motivated change by individuals to better live with diabetes. Marrero makes the need of support starkly clear observing that social isolation has effects on mortality, at the individual level, comparable to smoking cigarettes. Not having a social support system can be as bad for our health as smoking. Marrero only briefly refers to online opportunities for individuals to find peer support. Gilbert et al more clearly define peer support in their paper, Online Communities Are Valued by People With Type 1 Diabetes for Peer Support: How Well Do Health Professionals Understand This? They offer a wide discussion of the value that diabetes patients see in online communities. They also outline some of the concerns that health professionals have of patients using the internet. Not all people with diabetes have family or a community that understand diabetes. Gilbert suggests peer to peer patient support is an additional avenues of support that can be effective. Community helps. Don’t let diabetes isolate us. I am not suggesting that community takes the place of quitting smoking, being active or loosing weight. I am suggesting that it is part of the mix, as important as other health risks and we need to say so. Our insurance will not pay for social relationships, our doctor can’t prescribe anti isolation medications but we can create community. Community that is good not only for our individual health but the well being of other too. Community is a win - win. Maybe we need labels on strips an insulin. Greatly Reduces Serious Risks to Your Health.